Now that I've got Natty Ubuntu (Beta1) looking very good on the Dell E520, it's time to put in a few bells and whistles. Actually, I had always resisted using Conky simply because most, if not all, of the information I would want to get from it, was available from additions to the gnome-panel. But with Unity, that's changed. 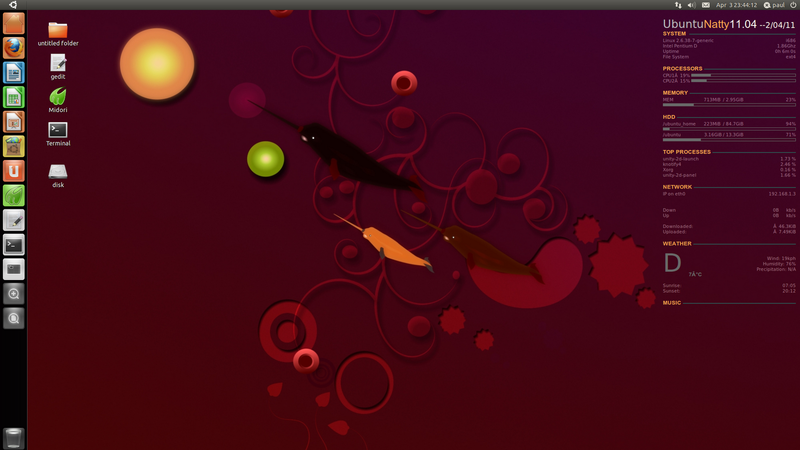 Also, I had seen a nice screenshot of a Desktop showing Conky and I was inspired. To get it started I basically used this tutorial as a guide. Conky turned out to be more complicated than I thought and a considerable amount of coding is required to set up the display. I had trouble getting the External IP to show up on my Conky display as the url in the guide doesn't seem to work any more. I tried various other options that I found on the internet until finally one worked for me which I got from here. Incidentally, for the screenshot, I temporarily disabled the External IP display so you wouldn't see it. As things stand, and as you can probably tell from the screenshot, I haven't configured the weather information yet. Basically, I used what was in the original guide with details provided from here. Essentially, getting Conky just right for me will take quite a bit of work but it should be exciting.